I have more stress in my life than I would like to. I need to learn how to minimise this and meditation keeps surfacing as a possible solution. Problem is, I don’t seem to be very good at it! Sitting quietly and breathing? Me, a busy working mum with 2 small children?Especially when I write about finding family work balance, you’d think meditation would be high up there on my list – isn’t “meditation” synonymous with “balance” to some people? To be honest, I don’t really know where to start to learn how to meditate “properly”. Perhaps that’s an excuse. There are a lot of different methods and I am just not sure which to choose. If I try to sit and breathe or focus, then often I either get frustrated or fall asleep! Oprah to the rescue. Several months ago, she and Deepak offered a meditation challenge and I signed up. 15 minutes a day sounded achievable and I’ve long admired Oprah. The few times I did try – I enjoyed it. It was a matter of listening to a recording on my iPhone. There is even a small chance it’s something I COULD do and COULD reduce my stress! Though for one reason or another, I kept making excuses as to why I couldn’t do the 15 minutes. The challenge finished and the free recordings became paid recordings. I didn’t buy them as I thought I was likely to pay the money and never use them. Then, another challenge arrived in my inbox. I’m going to try again. It’s free and I have nothing to lose I figure – and may even do better this time! Have signed up and it starts on Monday 5th August. Care to join me? 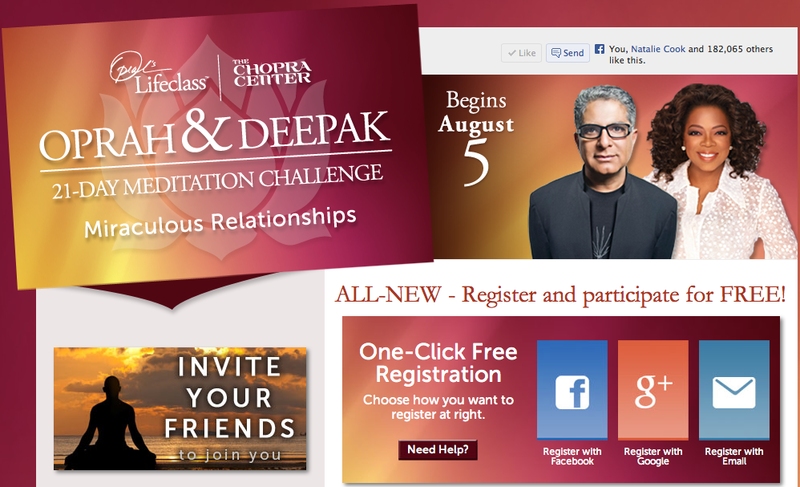 You can sign up for the free 21 day Oprah & Deepak meditation challenge here. Love to hear your comments below. Have you meditated before? Did it or does it work for you? Will you join this challenge? I got curious about meditation while doing the Mindfulness Parenting course, then read on more about zazen (Zen based meditation), did a short beginners Zen course and now am trying to incorporate it into my daily life whenever I can. I don`t know if you`ve ever read Momma Zen by Karen Maezen Miller, I read it when I had N and that was the first “parenting” book that didn`t make me feel like a parenting failure :). She then wrote Hand Wash Cold, which is basically applying Zen principles in everyday, ordinary life. I have both books if you ever want to take a look. I will check out what kind of meditation they do in this challenge, (guided I presume? ).